On 4–5 June this year, another ADAMED SmartUP Academy workshop took place. This time the topic was chemistry. A group of young people spent two days discovering the secrets of chemical laboratories and conducting fascinating experiments. The accelerated laboratory course in perpetrator identification was extremely popular. During the workshops, the scientists introduced the high school and middle school students to the methods used by forensic experts and the specialised means applied in criminal investigations. Becoming familiar with the harmful ingredients of cosmetics, the young people also learnt that it is not just anger that marrs beauty. 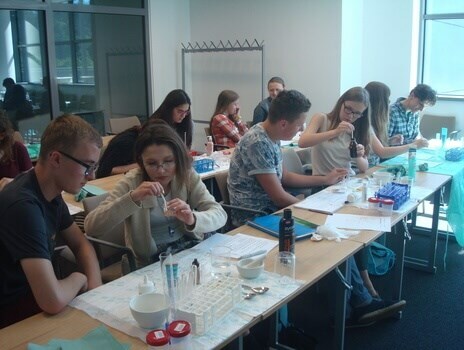 Moreover, the instructors talked about the structure, properties and functions of amino acids and proteins in living organisms, discussed the synthesis of peptides and described selected methods of purifying and identifying chemical substances. The ability to conduct experiments independently in well-equipped laboratories helped the understanding of such complicated issues. Most of the students admitted that such equipment was not available at their schools and the workshops gave them an opportunity to experience science in practice. The meeting was held as part of the ADAMED SmartUP Academy – a programme of innovative courses for young science enthusiasts aged between 15 and 19 years. The workshops are cyclically organised in five major cities in Poland. Their form gives the youth a chance to talk with experts and exchange ideas with their peers.